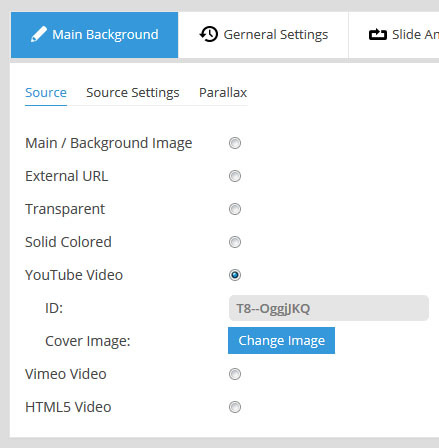 Click the “Change Image” button to select an image you’ve already uploaded, or to upload a new image for the slide. The absolute url to the selected image (read-only). 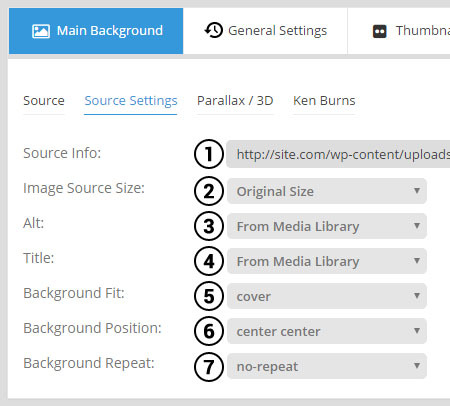 When you upload an image to a WordPress site, WP will automatically create multiple size versions of the image that can be used. And for your slide’s main background image, you can choose which of these versions you’d like to use. Common options are “Original Size”, “Medium” and “Large”. A reasonably sized main background image for web is around 1600×900 pixels. If your original images are larger than this, you can choose “Large” or “Medium” here, and this will help to improve page loading performance. Value is taken from “WP Menu -> Media -> Library -> Select Image -> Alt Text”. Alt text will be the same as the name of the file (i.e. “my-image.jpg”). Enter your own custom text to be used as the image’s Alt Text. Value is taken from “WP Menu -> Media -> Library -> Select Image -> Title”. Title attribute will be the same as the name of the file (i.e. “my-image.jpg”). Enter your own custom text to be used as the image’s Title attribute. The most common option. This will ensure that your image will always fill the entire size of the slider (cropping may occur depending on the size ratio of the image in relation to the slider’s layout). Always fit the entire image inside the slider’s boundaries. Image cropping will never occur, but you may end up with blank space on the sides of the image (similar to a letterbox movie on an older television screen). Curious about what the best size is for your images? Click here for some information about this topic. 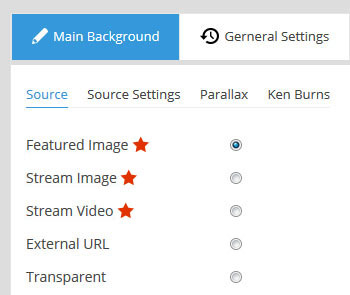 Check out the “Parallax Levels” part of the link above for help with choosing a “level” if you wish to use this option. If you want your image to “zoom in”, set the “From” value to “100” and the “To” value to something larger than 100 (such as 150, which means the image would scale up by 50%). If you want your image to “zoom out”, set the “From” value to something larger than 100, and then the “To” value to “100”. These offset values are in relation to your main background image’s Background Position value (see section B above). For example, if your Background Position is “center center”, entering a Horizontal Offset of “100” would mean 100px to the right of the very center, which would then serve as the starting position of the Ken Burns effect. And a Horizontal Offset of “-100” would be 100px to the left of center. 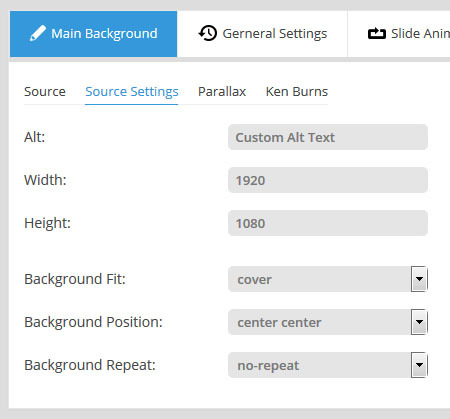 The main background image's "Background Position" (see section B above) plays an important role when setting up your Ken Burns effect. For an example, set your "Scale To" value to "200", and your "Scale From" value to "100". Then set the image's "Background Position" to "center center" and preview the slide. Then go back and change the "Background Position" to "top left", and this will give you a good idea of how the main image's "Background Position" impacts the Ken Burns animation. Apply a starting and ending rotation for the effect. Smaller degrees such as 10-20 work best. 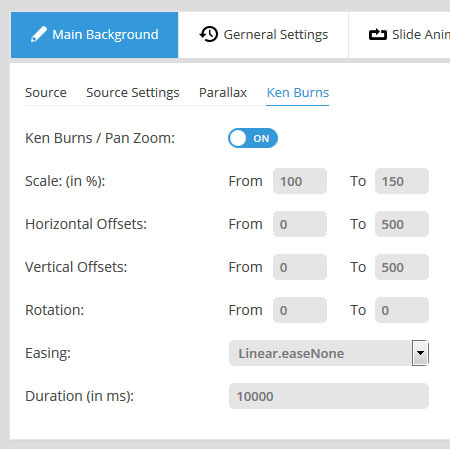 “Easing” is what gives a web animation that “real life” type of movement. For a traditional Ken Burns effect, “Linear.easeNone” is usually the best choice. But you can test the other options to see which one you like best. The total time the Ken Burns effect will last, in milliseconds (1000 = 1 second). It’s usually best to set this to the same number used for the slide’s delay value (“Edit Slide -> General Settings -> Slide Delay”). Type the full url of the image you wish to use from the external domain, and then click the “Get External” button. Optional field to write an “alt” attribute for the loaded image. Useful for enhanced SEO. Assign a width and height for the loaded image which will be used for resize calculations (it’s best to enter the loaded url’s actual width and height here). i.e. “No Slide Background”. Useful for when you want to use a single background image for your entire slider. Use a solid color as the slide’s main background. 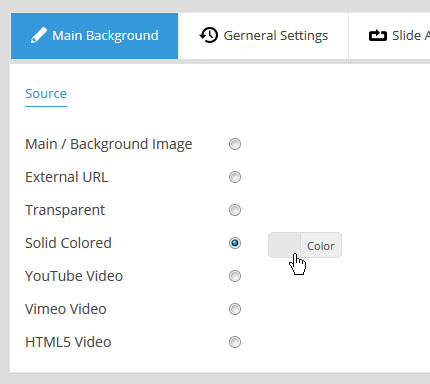 Click the “Color” button to choose a color. The ID will be after the “v=” part of the url. In the following url example, the ID is “ZmKdKZOX72Y”. 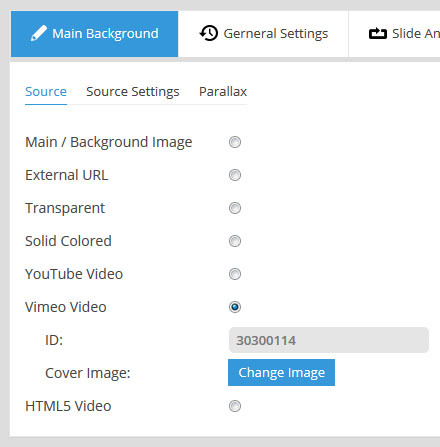 Click the “Change Image” button to set a poster for the video, chosen from your WP Media library. Want to use the same preview image from the original video? … use the following url format (replacing the “ZmKdKZOX72Y” part with your video’s ID) to download a copy of the original high-res version from YouTube.com. Video will only play once each time the slide is shown. 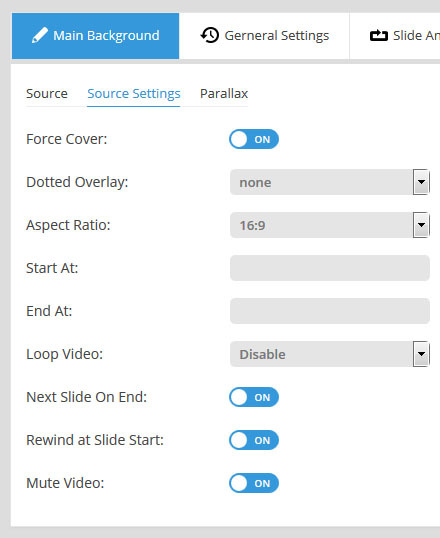 Video will loop endlessly, and the slide will never change unless the slider’s navigation is used (next button clicked, etc.). Video will loop endlessly until the slide’s delay is reached. 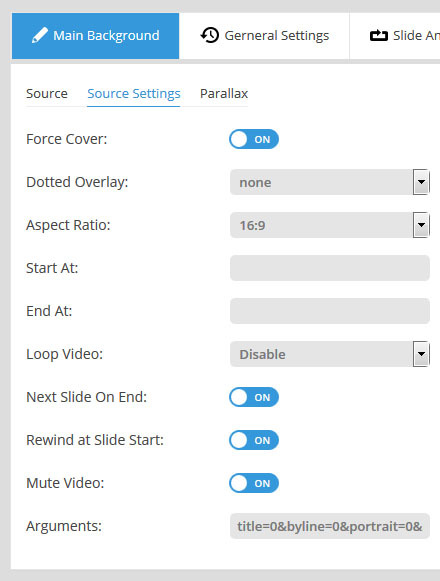 For example, if your slide’s are normally meant to be shown for 10 seconds, but your video’s length is only 5 seconds, the video will play twice before the slide actually changes. Not all params are supported, but useful options from the list are “rel”, “iv_load_policy”, and “modestbranding” (see link above for descriptions of these params). To add an additional parameter, prepend it to the beginning of the default params string. The ID will be after the “vimeo.com/” part of the url. In the following url example, the ID is “118046336”. Useful options from the list are “color” and “title” (see link above for descriptions of these params). 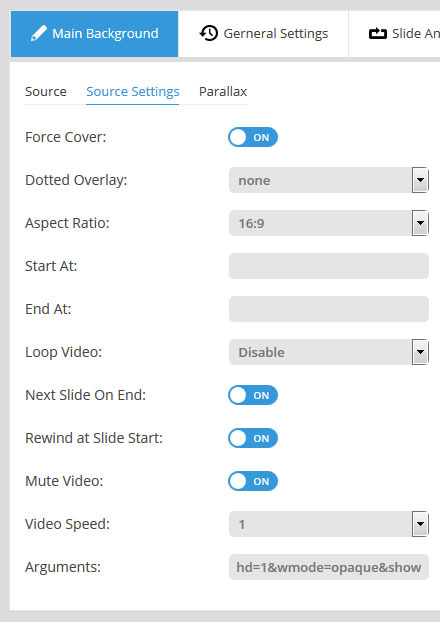 Upload a video to your site via ftp, and enter the full url of the video in the fields shown in the screenshot below, or click the “Change Video” button to choose a video from your WP Media library. 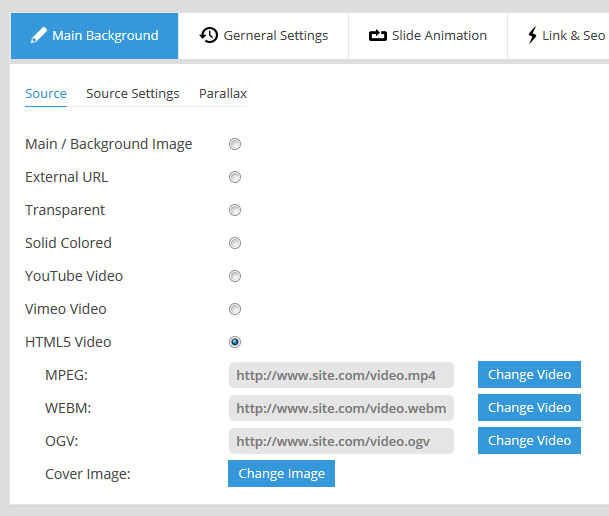 Click the “Change Image” button to set a poster for the video, chosen from your WP Media library. The video’s “cover” is what will animate when the slide first appears. If you’re using a special content source such as a “Facebook” or “Instagram”, you’ll be presented with one of the 3 new options shown in the screenshot to the right. 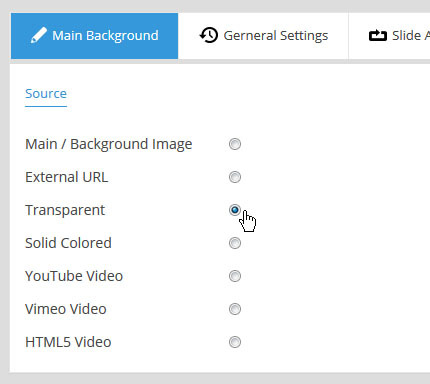 Special background source options and related background source settings listed below.